The Magic Key To Tennis - 1 Thru 10 System. This instructional and motivational book will help beginning to advanced tennis players reach levels of achievement they always dreamed of - in 80% less time. It is supplemented with the inspiring true story of the author and his endearing student, Howie. The reader will learn to hit the right shot every time - where they want it, when they want it - with the precise amount of spin. In this technical and heart warming manual the author shares how, through discipline and intelligent practice, he reached an unprecedented dream, and thoughtfully guides us to reach ours. In a devastating car crash at age 23 my tennis career as a world ranked professional abruptly ended. After discovering an innate ability to teach, I opened The Los Angeles Tennis Academy with my brother where we coached many celebrities including George Clooney, Alec Baldwin, and Robert Downey Jr., as well as famous rock stars, NFL owners, world ranked juniors and adults. I also taught physically and mentally disabled children and kids of all ages - all with amazing success. However, I felt compelled to pursue a latent dream outside of the tennis world. Ultimately, I spent the next twelve years teaching tennis eight hours a day while studying music five hours deep into every night. 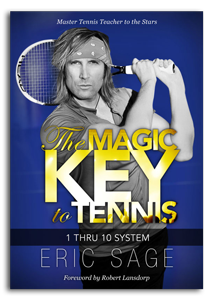 During this transformational time, I developed The Magic Key To Tennis - 1 Thru 10 System. It is a simple yet revolutionary concept that will change the game of tennis. This book is not only for tennis players, but is also a self-help book about going after one’s individual dreams. Interspersed chapters explain this amazing tennis system and how it arose from my personal struggles, along with true accounts of my tennis students’ successes here for you. Wait until you hear his inspirational story! read the Foreword by famed tennis coach, Robert Lansdorp (coached the most #1 world ranked tennis players in the history of the game).